As a marketing professional, you understand the key role brochures can play in doing your job successfully. Often times, brochures are a reminder of your business to customers and potential marketing piece for their friends or family members. In other cases, it can be a valuable resource to new or old customers who need more company information. You may not know, however, that there are ways to tweak the look of your brochures that will increase your success in advertising for small business and more. This post will give you some insight to various elements that will make your brochures design the best possible for your business. Before you start working on your brochures design, the absolute first thing you must to is determine a purpose for the brochure. Going into the project blind will make the process take much longer, often with less impressive results. Be sure to know what you need the brochure to do for your business. Then, create a plan of action that will allow you to achieve that objective. Before you every start worrying about how to design brochures for business goals, be sure you know what those goals are for each specific project. The staple tri-fold brochure can hold a large amount of information but it is important to keep things as simple as possible for the recipient. After all, this is also what the best trade show booths do. If your brochure has too much writing, you may be overwhelming the reader with too much information too quickly. It could be valuable to make use of bullet points with short, concise statements. This will allow you to highlight important aspects you would like to focus on while ensuring if the reader is liking what they’re reading, they will need to reach out to you to learn more. It is important to know the worth of the front page of your brochure. This is the first thing prospective clients will see whether you’re handing the pamphlet to them or leaving them on a tabletop somewhere. Limit the amount of information you put on this page to the basic information of the business: name, location, and a topic statement to be covered in further detail inside. It may also be a good idea to make use of a picture or business logo here, as it will catch the prospective reader’s eye and give them an idea of what’s to come on the following pages. 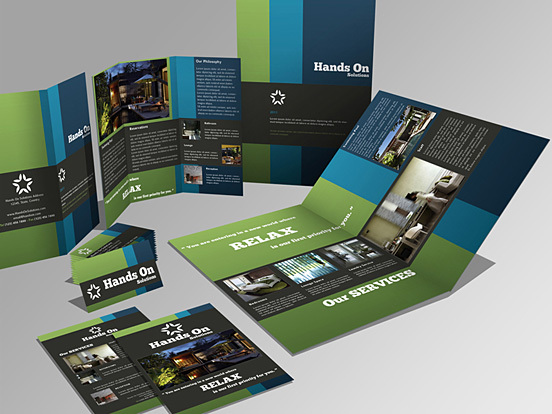 Of course, the first thing that comes to mind when a brochure is mentioned is the traditional tri-fold design. But, standing out is a key component to successful marketing. Using a variety of shapes, colors, and inserts will give you a leg up on the competition. Which brochure would be more likely to catch your eye and impress you, the trifold black and white one or the bright blue circular five-fold that has a CD insert? Certainly, being a little different will appeal to most target audiences. There are many factors that go into creating a successful brochure design, whether you plan to use it for sports marketing ideas or some other purpose. Most importantly, if you remember these three things, you cannot go wrong: keep it simple, the front page is key, and make it unique. Try to use a variety of colors and shapes, keep the information inside concise and neatly arranged while paying close attention to the front page. If you keep these tips in mind when creating your next brochures design, you and your business will both reap the benefits.